The Opposite Of Lonely. — Megaphonic. Sometimes you get caught up in city life, and the city starts feeling small, a bit mundane, and isolating. You forget that there’s millions of other people having completely different experiences than you. Which is the reason I live in the city, right? That’s the most exciting part of living in the city, is that you have all these stories happening right next to you. On this episode, we look at a topic close to my heart: walking in groups, with friends or strangers. Going on walks around Toronto is how I got to know the city and how I met many of my friends, including Dylan, whose love of walking led him to co-found an advocacy group that works to make the sidewalks safer for pedestrians. Juan is on the Toronto organizing team for this year’s Jane’s Walk festival, the Jane Jacobs-inspired event where ordinary people across Toronto, and in many cities globally, lead “walking conversations”. We talk about what makes walking a great way to socialize (for introverts and extroverts alike), how exploring your city can make you more aware of its history and of the other lives going on all around you, and how anyone can lead a Jane’s Walk, get involved in pedestrian advocacy—or just round up some friends and start wandering. Dylan Reid is one of the founders of Spacing, a magazine about Toronto's urban landscape; he’s Spacing's book series editor and the author of the Toronto Public Etiquette Guide. He is also one of the founders of Walk Toronto, a grassroots advocacy group. He has a Master's degree in history and is a fellow at the Centre for Reformation and Renaissance Studies at the University of Toronto. Juan Gonzalez-Calcaneo’s first passion was filmmaking; studying film was the reason he initially came to Toronto from his native Mexico in the early aughts. Since then, Juan has focused on developing engaging communications strategies for important non-profits arts organizations and festivals in Toronto, leading him to open his own boutique communications agency. Juan’s dynamic career also includes a successful four-year run as a panelist on a hit MTV show breaking down stigmas attached to the LGBTQ community. He continues to advocate for and promote the arts and other causes he’s passionate about, leading him to become a Jane’s Walk Toronto 2019 City Organizer. 50 Toronto Hidden Gems & Curiosities, edited by Dylan Reid and Matthew Blackett. Nyctophilia, a public art installation on Weston Road. Jane’s Walk (Facebook, Twitter, Instagram). Jane’s Walk in Toronto (Facebook, Twitter, Instagram). Internet Mysticism in Wychwood Park. The leather bar was mentioned in an episode of This Is Your Mixtape. Some background on Toronto’s buried rivers. Toronto Company of Flâneurs and Flâneuses on Facebook. 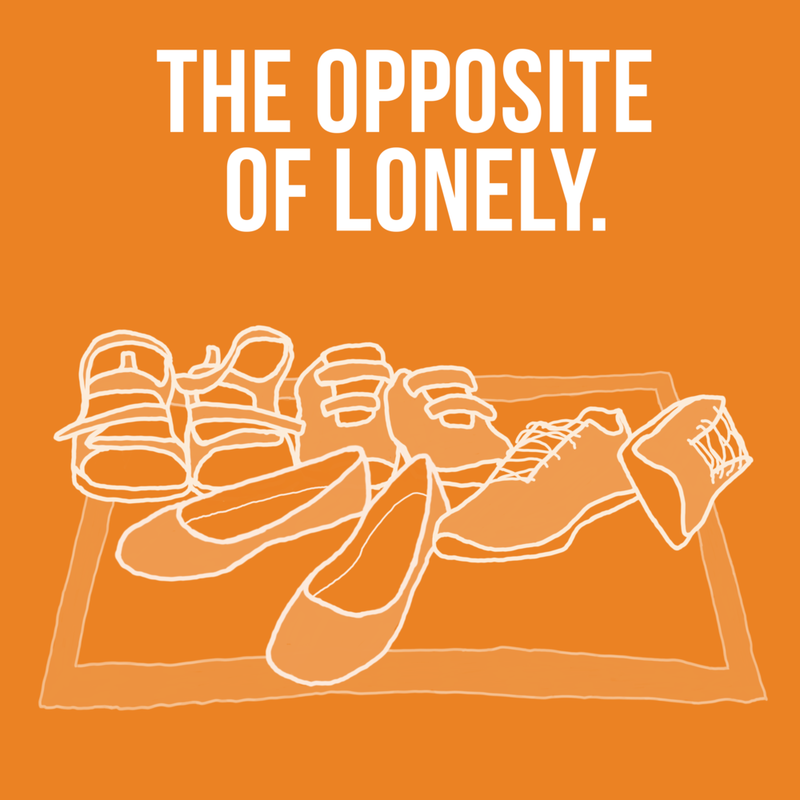 Subscribe to The Opposite Of Lonely via Apple Podcasts | Overcast | Google Podcasts | Spotify | RSS. From the “immediate family” of a community theatre production, to the “Lord of the Rings fellowship type situation” of touring with a band, close relationships with collaborators are a big part of being a musician. I talk to two Toronto-based musicians about how technology and economics have changed the music scene over the past couple of decades (not necessarily for the better or worse), and how music has always been a part of how they see themselves and how they connect with other people. Find out why Kristin has a love/hate relationship with Instagram, what it meant to Simon in the mid-’90s to see someone wearing an Operation Ivy patch, and how the ukulele can be “an instrument of peace and community building”. Simon Borer has been hanging around the Toronto music for the better part of two decades, starting as a doorman at the Silver Dollar, watching Dan Burke’s every move, then as the frontman for Entire Cities, touring the country and opening for artists like Sloan, Rock Plaza Central and Wolf Parade. Currently he records under the name Traplines, and is in production on his first feature film. Kristin Fung’s dynamic and versatile performances as a vocalist, keyboardist, and composer traverse multiple musical landscapes. She leads her own R&B band in original tunes infused with her signature super funky soul grooves. She is a member of Anthony Braxton’s Tri-Centric Vocal Ensemble, and a featured soloist in the live and recorded versions of Braxton’s experimental opera Trillium J. She’s also part of Christine Duncan’s The Element Choir; creator of celeste, a contemporary vocal/dance trio; and she’s half of the hip folky duo K Funk and Lady Ree. She has performed at many venues in Toronto and beyond. CFRC — Campus Community Radio. BET’s “Midnight Love” is no longer around, but here’s a YouTube playlist with some key tracks. Find Kristin Fung on Instagram and Spotify. Simon Borer’s current musical project, Traplines. Well, of course we had to do a holiday episode! If you feel isolated—either because you’re alone for the holidays, or because you don’t feel close to the people you’re spending them with—this can be a lonely time of year. But it can also be an opportunity to try to create the kinds of get-togethers and traditions you wish you had, even if those don’t look conventionally “festive”. If you’re the kind of person who does love the holidays, it can be a chance to share the cheer. And also, honestly, this time of year can just be straight-up weird. Especially if you spend it at the mall, dressed as a cartoon rabbit. You’ll hear that story from one of my guests, as well as several stories sent in by listeners, who have tried everything from joining the festivities of a Christmas-loving family to opting out of the holidays altogether. Shari Kasman is a writer, multidisciplinary artist, and piano teacher. Her collection of short stories, Everything Life Has to Offer, exists thanks to Invisible Publishing. She has created art for both private space and public space, including a photocollage around a construction site. Most recently, Shari made a photo book about Toronto’s Galleria Mall. It is called Galleria: The Mall that Time Forgot. Her background is in music. Chris Piuma spends most of his time podcasting these days. He’s one of the co-founders of Megaphonic FM and he’s the producer and editor of this very show. He also hosts The Scene Of The Scene, which tries to capture the conversation you have with your friends when you’ve just seen a movie together. He created The Scene Of The Scene to make himself leave the house and see his friends more. Many young adults in the UK say they have no-one to spend Christmas with. The Great Christmas Get Together Advent Calendar. Buy Galleria: The Mall that Time Forgot by Shari Kasman. 10. Working Arrangements that Work. For better or worse, the world of work is changing fast. With the increase in freelance and contract work and the advent of telecommuting, more and more people have paying work that doesn’t come with office space. Working for yourself can be liberating, and working from home can be convenient, but both can also get lonely and isolating in the long run. People are trying all kinds of strategies and setups to get around that: co-working spaces, working in cafes, teleconferencing. What’s the best way to be with people while working independently? When Ange had a job in a library, she would look at people working in coffee shops with longing and envy. Now she is one of those people, when she’s not in a studio, co-working space, or her own living room. Jessica is fascinated by offices and co-working spaces from an anthropological perspective, but finds that folks at her current co-working space don’t tend to come out to social events, even for free ice cream. Can meeting or working with people digitally—i.e., via videoconferencing—sometimes be as good as having co-workers? Do you want the people you work with to be your friends, or is it enough just to get along with them? And what would the perfect work setup look like? Ange Friesen is a writer and creative strategist who describes her work as brand therapy for beautiful ideas and their people. Ange combines her background in marketing and copywriting with her training as a psychotherapist, helping creative people and companies figure out who they are and how to share their ideas with the world. Ange lives in Toronto and works everywhere. Jessica Taylor followed her wife to Cambridge, Massachusetts, and is currently a Research Associate at Harvard. As of her move, she now belongs to three book clubs and one reading challenge. Ange Friesen’s brand therapy website. The Centre for Social Innovation is one of Toronto’s oldest and best known co-working communities. Make Lemonade is a women’s co-working space in Toronto. The co-working space in Malmö. ‘The flexibility is incredible’: When companies ditch the office, everyone's a remote worker (CBC). Have you ever wanted to get away from it all—but not, you know, too far away? Would the idea of living communally with like-minded people appeal to you, if you knew you could go into your own room and shut the door and everyone would leave you alone? That comfortable balance of solitude and company is something many of us look for. It’s particularly important to artists and writers, most of whom need time alone to work, but draw inspiration and encouragement from talking to each other. For this episode, Megaphonic’s Chris Piuma and I took the ferry out to the Toronto Islands to visit Artscape Gibraltar Point, an artists’ residence designed to create an environment where it’s possible to find that balance. We talked to staffer Andrew Lochhead and several of the residents, and later I sat down for a longer chat with Anna Synenko and Julia Tausch, two writers who have returned to AGP many times over the years. The consensus, more or less: AGP is a great place to be alone—to hunker down and work, commune with nature, or even just sit with your loneliness for awhile. And when you start to crave company, there’s always the kitchen. Julia Tausch is a writer living in Toronto. She wrote the novel Another Book About Another Broken Heart and has published fiction and essays in publications such as Hobart, CBC Arts, The Hairpin, and Bon Appetit. She is currently working on a memoir that investigates abledness. After a long career in publishing, Anna Synenko now creates projects for film and television exclusively, producing original scripts in full feature, comedy, documentary, and factual. She currently has created two documentary series that are signed to a London UK television production company, is optioned to write a big budget historical film with another UK company, and her adaptation of Amanda Lear’s My Life with Dali is currently with a European producer based in Amsterdam and LA. She works closely with filmmakers to teach script writing or doctor existing scripts. Self-taught, she’s spent approximately 5 years nomadically moving around, writing scripts, developing shows, and honing her craft to make stories honest in the revealing, daring in the execution, and provocative in the telling. Photos from our visit to Artscape Gibraltar Point. Anna Synenko’s website, featuring a photo of her Artscape Gibraltar Point studio in winter. Julia Tausch’s first novel, Another Book about Another Broken Heart. A number of people contributed to making this episode happen: Daniel Rotsztain put me in touch with Anna, Julia and Luisa. Andrew Lochhead provided all the information I needed, plus a guided tour and introductions. Chris Piuma did the onsite recording, had valuable input into pruning and shaping the episode, and went above and beyond with the editing. And, of course, thanks again to all the Artscape Gibraltar Point folks who talked to us: Alicia, Eunice, Barbara, Rae, Luisa, Marina, Julia, and Anna. The Opposite Of Lonely. Who are “your people”? Where is everyone hanging out? What puts the quality in quality time? Come join Nadia and friends as they chat about social connectedness.